In October 2014, the Stewart family stood on an outdoor rooftop patio overlooking Times Square in downtown Manhattan. Surrounded by almost 300 people, Scott Stewart, president of the Peterborough travel agency Carlson Wagonlit Stewart Travel (CWST), along with his sister and business partner, Dana Empey, proudly told the crowd they had been a part of history. 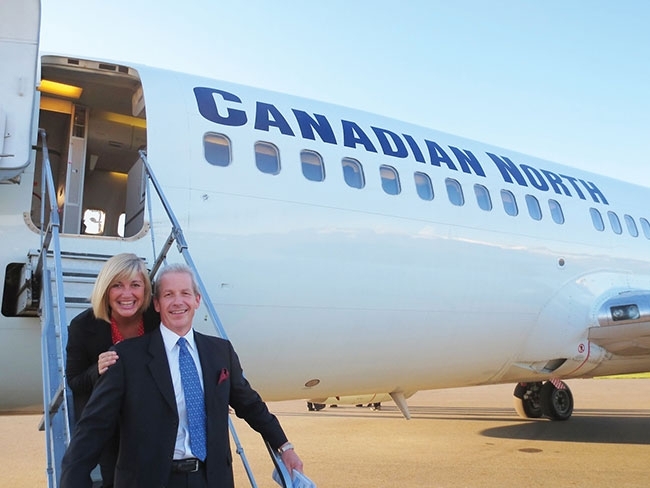 They were the first to ever charter a full-fledged passenger aircraft — a 737 — out of the regional Peterborough Airport. Since then, CWST has successfully sold similar custom tours departing out of Peterborough and created a customer experience like no other. Below, Stewart explains the origins of the airport-in-a-box idea, how it became a success, and the exciting potential for other smaller regional airports throughout Canada. Scott, how did this idea come to be? You didn’t start out thinking this would become a whole new side of the business? Not at the time, no. It was supposed to be a one-off thing, just to celebrate our anniversary. But once we started going down that path, we could see there was a market for something like this. I emailed Trent Gervais, the general manager of the airport, asking if this harebrained idea could work. He responded with “Yes, let’s meet at your earliest convenience.” Neither of us had any idea how we would pull this off! But almost immediately, everyone at the airport was on board and over-the-moon helpful. What was the hardest part in terms of logistical planning? Finding a carrier. Nine airlines weren’t interested. Most of them weren’t even aware that the Peterborough airport had gone through such growth or that it had 7,000 feet of paved, lighted runway. Ultimately, Canadian North took us up on the offer. What about dealing with things like customs and governmental approvals? We had to ensure we were abiding by all provincial and federal statutes, and by security and customs — especially since we were crossing the Canada-US border. It took over a year, but all agencies were eventually extremely receptive. When we were setting up the entire operational system at the airport, all those agencies were on-site. We discussed where shortfalls might happen, where flow would be, what needed to be locked off during the waiting period prior to departure..
What primary risk was involved? Meanwhile, there is also a reputational risk. Your word is your bond, you’ve got lawyers involved and tons of contracts, so you’re on the hook for everything. And how was the customer response to the New York trip? It blew us away! The trip sold out in 48 hours. We promoted it as “be part of history,” that is, being the first people to ever fly out on a 737 from the Peterborough airport. Even folks from Peterborough who had been living in Florida for the winter were calling us. The response was so good, we decided to charter a second plane for the trip. By the time we got all the required approvals, we had that second plane sold as well. We ended up taking 272 people to New York City and had an amazing anniversary party on a rooftop patio overlooking Times Square. How did you deal with systems at the airport, since they haven’t done passenger charters before? There were no facilities for passenger travel there, so everything had to be created from scratch. We hired developers to create our own software, which oversees everything including check-in, inventory control, seat assignment, baggage tags and boarding passes. That was daunting at first, but also the best situation because we got to create the entire client experience. What kind of planning went into the client experience? Our team wanted to create an experience at the Peterborough airport unlike any other. We mandated three components into the process. First, it needed to include aspects of what you’d experience at a business class check-in. We also wanted customers to feel like they were at a massive private golf club where you’re personally greeted at the entrance, you’re able to stay in your car, you pop the trunk and someone takes out your clubs. And we wanted a smooth embarking and disembarking experience, like what they do on cruise ships. Were you able to integrate all those components into the check-in experience? Yes — When you drive onto the airport property, you are greeted by someone with an iPad who checks you in. Then you drive into a private hangar. An employee takes your passport, hands it to a runner for verification and then you pop your trunk and a baggage person tags your luggage and carries it out. You get your boarding pass and within two minutes you drive out. It’s kind of like a drive-through Tim Horton’s, but for check-in. You also get free parking in front of the terminal and, as you’re waiting in a private lounge, you’re offered refreshments — all complimentary. We also offer full complimentary meal and beverage service on the flight. I should also mention that Carlson has been fortunate to receive help from Holy Cross Secondary School. These students are interested in aviation and they come out on departure days to help with things like baggage and flow and directing traffic. It’s been a wonderful partnership with the school and the students get to see what it’s actually like to work in an airport. How do you manage security issues? On departure days there are GardaWorld Officers who travel from Ottawa for full security for both passengers and baggage. After the anniversary trip, why did you continue to offer these charter tours? We had the systems already in place and, with such a great response, we decided to make it a regular part of our business. So, over the last three years, we have chartered four 737s per season between May and October. Each tour is like a mini-vacation — about four days in length, including the flight, accommodations and all sorts of activities. We try to offer things that are out-of-the-box. For example, going behind-the-scenes at Fenway Park in Boston or a foodie tour, where we go to several areas of a city, stopping at cafes and restaurants to try different ethnic specialties. We also send two hosts along on each tour. Most would be considered short-haul flights. Cities have included New York, Chicago, Boston, Nashville, St. John’s, New Orleans, Charleston, San Antonio, and Charlottetown. How have customers reacted to these tours? We have a very significant repeat factor. Keep in mind: until now, people living in Peterborough and the surrounding community had to travel to Toronto for passenger flights. That’s at least two hours of driving, possibly paying for a hotel room overnight and for parking, feeling like cattle walking through turnstile after turnstile in a busy airport, and having to drive another two hours home upon arrival. Flying out of Peterborough, there are a lot of perks and extras thrown in that you wouldn’t get. Everybody is treated like a VIP. And as the word gets out more and more about us, we are seeing more interest and more new faces on our charters. Now that we’ve created all these systems, software and IT, we hope to take this “airport-in-a-box” service to other regional airports, offering them the opportunity to do what the Peterborough airport has done with passenger charters. Meanwhile, we see so many more avenues beyond what we’re currently doing and we are continually looking ahead. We are just getting started. Overall, what do you think is the key to your success with this idea? I never take the word “No.” All my life, I’ve heard people say, “We can’t do this.” But I’ve been in this industry for 32 years. The CWST team immersed itself in something we strongly believed in — something we knew could work — and because of that, we were able to convince all the right parties to go along with us. On that note, I’d like to recognize all agencies for their support — particularly the Peterborough Airport and city of Peterborough for helping us to offer this exciting type of travel to the entire community.